SITTWE, MYANMAR -- Myanmar police will begin arming and training non-Muslim residents in the troubled north of Rakhine State, where officials say militants from the Rohingya Muslim group pose a growing security threat, police and civilian officials said. Soldiers have poured into the Maungdaw area along Myanmar's frontier with Bangladesh, responding to coordinated attacks on three border posts on Oct. 9 in which nine police officers were killed. Security forces have locked down the area - shutting out aid workers and independent observers - and conducted sweeps of villages in Maungdaw, where the vast majority are Rohingyas. Official reports say five soldiers and 33 alleged insurgents have been killed. 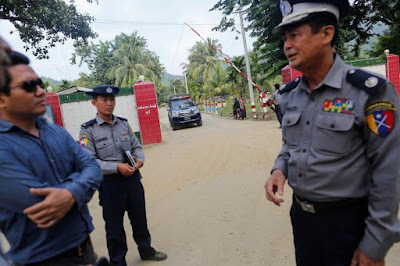 Rakhine State police chief Colonel Sein Lwin told Reuters his force had started recruiting new "regional police" from among the ethnic Rakhine and other non-Muslim ethnic minorities living in Maungdaw. "They will be given weapons and other equipment, like police," said Lin Lin Oo, an aide to the commander of the border police in Maungdaw, who will oversee the auxiliary force. Police and civilian officials said the auxiliary police recruits would not form a new "people's militia", like those that fight ethnic insurgencies elsewhere in Myanmar. Min Aung, a minister in the Rakhine State parliament and a member of Suu Kyi's National League for Democracy, said the recruits would help protect residents from the militants, estimated to be 400-strong, responsible for the Oct. 9 attacks. "The minority ethnic people need to protect themselves from hostile neighbors," said Min Aung, referring to non-Muslim ethnicities who are in the minority in the region. "That's why the government supports them as regional police, as well as with employment." Suu Kyi's government has invited diplomats and the senior United Nations representative in the country on a visit to Rakhine from Wednesday to try to assuage concerns over aid access and rights violations. "It's sad and telling that the authorities regard this move as part of a security solution," said Matthew Smith, founder of Fortify Rights, a campaign group. Arming local Buddhists who may regard all Rohingyas a threat to their safety was "a recipe for atrocity crimes", Smith said. "It can only inflame the situation and will likely lead to unnecessary violence." Kyaw Win, an ethnic Rakhine resident of Kyein Chaung village, in Maungdaw, told Reuters by phone on Wednesday that he was interested in signing up for the training, but said he doubted the plan would allay his community's security fears.